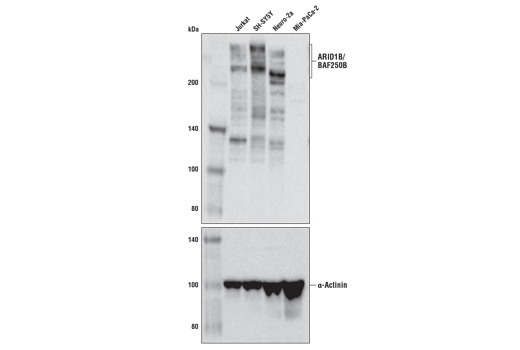 Western blot analysis of extracts from various cell lines using ARID1A/BAF250A (D2A8U) Rabbit mAb. Western blot analysis of extracts from various cell lines using ARID1B/BAF250B (E9J4T) Rabbit mAb (upper) and α-Actinin (D6F6) Rabbit mAb #6487 (lower). MIA PaCa-2 cells do not express ARID1B/BAF250B protein. 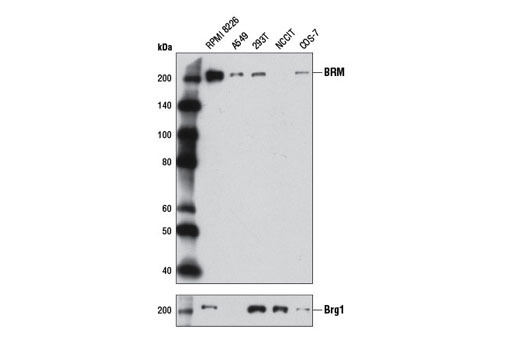 Western blot analysis of extracts from various cell lines using Brg1 (D1Q7F) Rabbit mAb. Chromatin immunoprecipitations were performed with cross-linked chromatin from MCF7 cells grown in phenol red free medium and 5% charcoal stripped FBS for 4 d followed by treatment with β-estradiol (10 nM, 45 min) and Brg1 (D1Q7F) XP® Rabbit mAb, using SimpleChIP® Enzymatic Chromatin IP Kit (Magnetic Beads) #9003. DNA Libraries were prepared using SimpleChIP® ChIP-seq DNA Library Prep Kit for Illumina® #56795. The figure shows binding across the ENSA gene. For additional ChIP-seq tracks, please download the product data sheet. 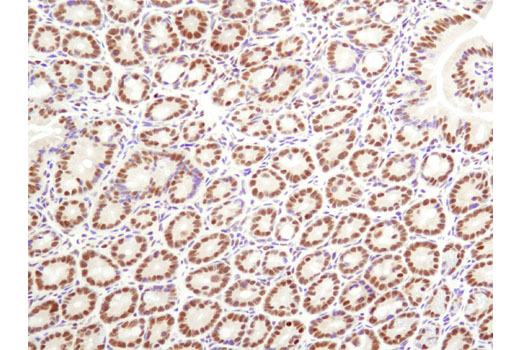 Immunohistochemical analysis of paraffin-embedded human colon carcinoma using BRM (D9E8B) XP(R) Rabbit mAb. 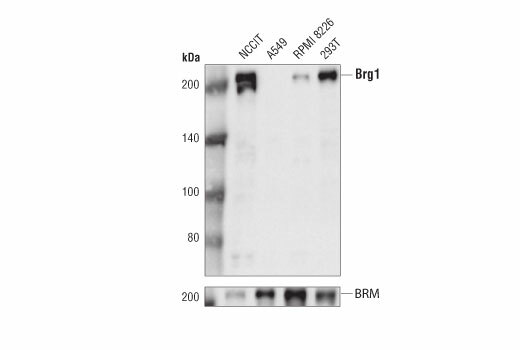 Western blot analysis of extracts from various cell lines using BRM (D9E8B) XP® Rabbit mAb (upper) or Brg1 (A52) Antibody #3508 (lower). 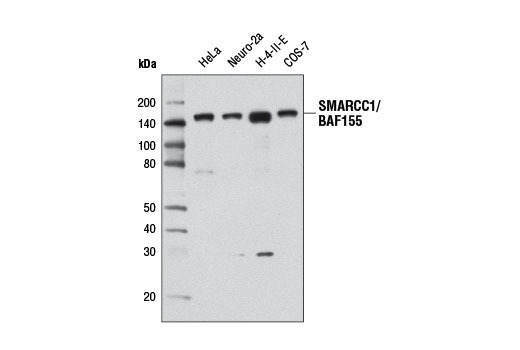 Western blot analysis of extracts from various cell lines using SMARCC1/BAF155 (D7F8S) Rabbit mAb. Chromatin immunoprecipitations were performed with cross-linked chromatin from MCF7 cells grown in phenol red free medium and 5% charcoal stripped FBS for 4 d, followed by treatment with β-estradiol (10 nM, 45 min) and either SMARCC1/BAF155 (D7F8S) Rabbit mAb, SMARCB1/BAF47 (D8M1X) Rabbit mAb #91735, or SS18 (D6I4Z) Rabbit mAb #21792, using SimpleChIP® Plus Enzymatic Chromatin IP Kit (Magnetic Beads) #9005. DNA Libraries were prepared using SimpleChIP® ChIP-seq DNA Library Prep Kit for Illumina® #56795. SMARCC1/BAF155, SMARCB1/BAF47, and SS18 are all subunits of SWI/SNF complex. The figure shows binding across pS2/TFF1, a known target gene of SWI/SNF complex (see additional figure containing ChIP-qPCR data). For additional ChIP-seq tracks, please download the product data sheet. 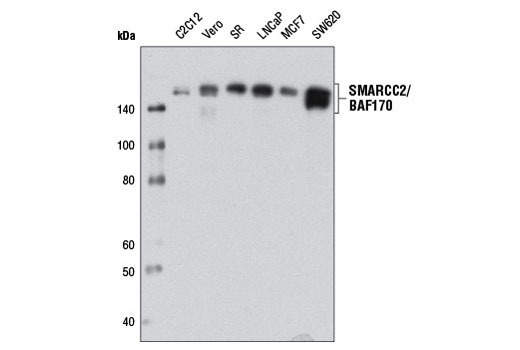 Western blot analysis of extracts from various cell lines using SMARCC2/BAF170 (D8O9V) Rabbit mAb. Chromatin immunoprecipitations were performed with cross-linked chromatin from MCF7 cells grown in phenol red-free medium and 5% charcoal-stripped FBS for 4 d followed by treatment with β-estradiol (10 nM, 45 min) and SMARCC2/BAF170 (D8O9V) Rabbit mAb, using SimpleChIP® Plus Enzymatic Chromatin IP Kit (Magnetic Beads) #9005. DNA Libraries were prepared using SimpleChIP® ChIP-seq DNA Library Prep Kit for Illumina® #56795. 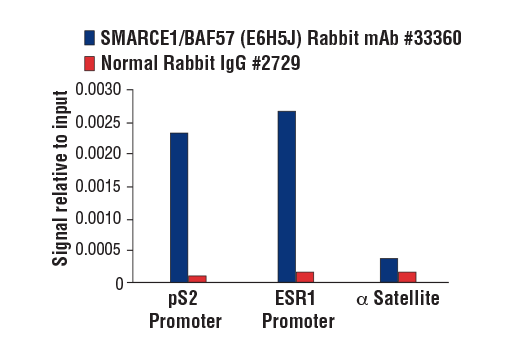 The figure shows binding across ESR1, a known target gene of SMARCC2/BAF170 (see additional figure containing ChIP-qPCR data). For additional ChIP-seq tracks, please download the product data sheet. Western blot analysis of extracts from various cell lines using SMARCE1/BAF57 (E6H5J) Rabbit mAb (upper) and β-Actin (D6A8) Rabbit mAb #8457 (lower). BT-549 is a breast ductal carcinoma cell line that lacks expression of SMARCE1/BAF57. 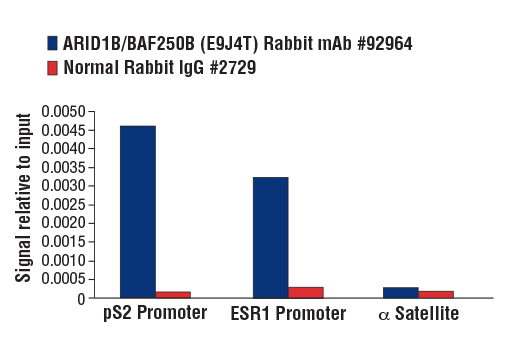 Chromatin immunoprecipitations were performed with cross-linked chromatin from NCCIT cells and either ARID1A/BAF250A (D2A8U) Rabbit mAb or Normal Rabbit IgG #2729 using SimpleChIP® Plus Enzymatic Chromatin IP Kit (Magnetic Beads) #9005. 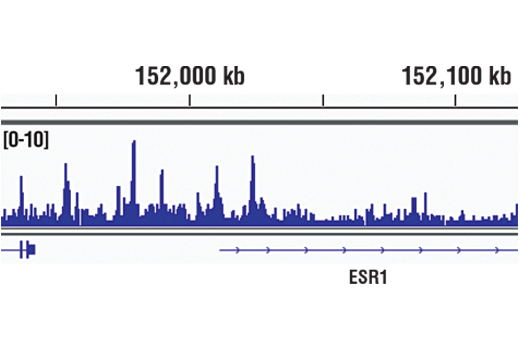 The enriched DNA was quantified by real-time PCR using SimpleChIP® Human Oct-4 Promoter Primers #4641, SimpleChIP® Human Sox2 Promoter Primers #4649, and SimpleChIP® Human α Satellite Repeat Primers #4486. 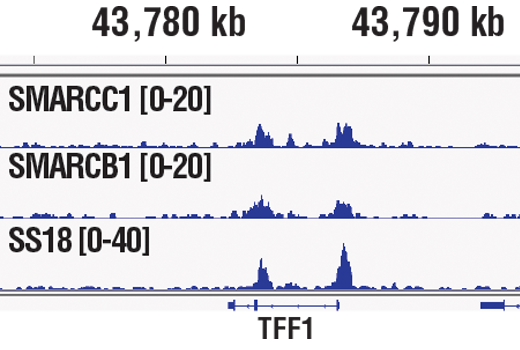 The amount of immunoprecipitated DNA in each sample is represented as signal relative to the total amount of input chromatin, which is equivalent to one. Western blot analysis of T-47D and Jurkat cell extracts using ARID1A/BAF250A (D2A8U) Rabbit mAb (upper) or ß-Actin (D6A8) Rabbit mAb #8457 (lower). 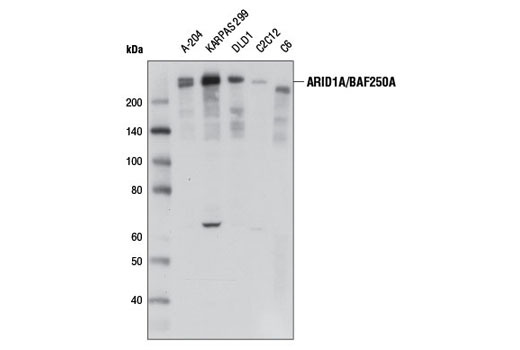 Additional ARID1A/BAF250A degradation products may be detected in some cell extracts between 135kDa-250kDa, which are absent in the ARID1A/BAF250A negative T-47D cell line. Chromatin immunoprecipitations were performed with cross-linked chromatin from MCF7 cells grown in phenol red free/charcoal stripped FBS for 4 d then treated with β-estradiol (10 nM) for 45 min and either ARID1B/BAF250B (E9J4T) Rabbit mAb or Normal Rabbit IgG #2729 using SimpleChIP® Plus Enzymatic Chromatin IP Kit (Magnetic Beads) #9005. The enriched DNA was quantified by real-time PCR using SimpleChIP® Human pS2 Promoter Primers #9702, SimpleChIP® Human ESR1 Promoter Primers #9673, and SimpleChIP® Human α Satellite Repeat Primers #4486. The amount of immunoprecipitated DNA in each sample is represented as signal relative to the total amount of input chromatin, which is equivalent to one. Western blot analysis of extracts from various cell lines using Brg1 (D1Q7F) Rabbit mAb (upper) or BRM (D9E8B) XP® Rabbit mAb (lower). Chromatin immunoprecipitations were performed with cross-linked chromatin from MCF7 cells grown in phenol red free medium and 5% charcoal stripped FBS for 4 d followed by treatment with β-estradiol (10 nM, 45 min) and either Brg1 (D1Q7F) XP® Rabbit mAb or Normal Rabbit IgG #2729 using SimpleChIP® Enzymatic Chromatin IP Kit (Magnetic Beads) #9003. The enriched DNA was quantified by real-time PCR using SimpleChIP® Human ESR1 Promoter Primers #9673, SimpleChIP® Human pS2 Promoter Primers #9702, and SimpleChIP® Human α Satellite Repeat Primers #4486. The amount of immunoprecipitated DNA in each sample is represented as signal relative to the total amount of input chromatin, which is equivalent to one. 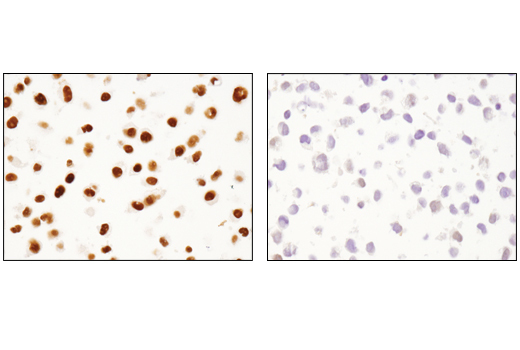 Immunohistochemical analysis of paraffin-embedded human prostate carcinoma using BRM (D9E8B) XP(R) Rabbit mAb. 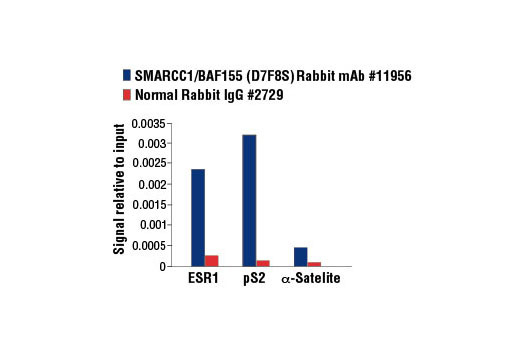 Immunoprecipitation of SMARCC1/BAF155 from HeLa cell extracts using Rabbit (DA1E) mAb IgG XP® Isotype Control #3900 (lane 2) or SMARCC1/BAF155 (D7F8S) Rabbit mAb (lane 3). Lane 1 is 10% input. 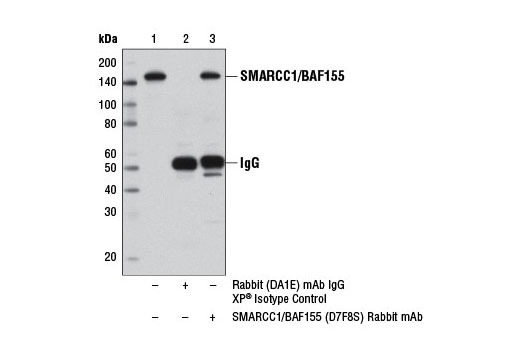 Western blot analysis was performed using SMARCC1/BAF155 (D7F8S) Rabbit mAb. Chromatin immunoprecipitations were performed with cross-linked chromatin from MCF7 cells, grown in phenol red-free medium and 5% charcoal-stripped FBS for 4 d followed by treatment with β-estradiol (10 nM, 45 min), and either SMARCC1/BAF155 (D7F8S) Rabbit mAb or Normal Rabbit IgG #2729 using SimpleChIP® Plus Enzymatic Chromatin IP Kit (Magnetic Beads) #9005. The enriched DNA was quantified by real-time PCR using SimpleChIP® Human ESR1 Promoter Primers #9673, SimpleChIP® Human pS2 Promoter Primers #9702, and SimpleChIP® Human α Satellite Repeat Primers #4486. The amount of immunoprecipitated DNA in each sample is represented as signal relative to the total amount of input chromatin, which is equivalent to one. 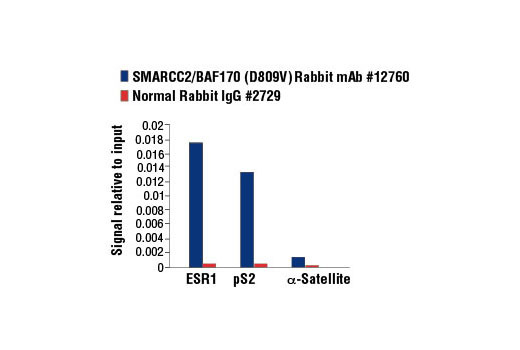 Immunoprecipitation of SMARCC2/BAF170 from PANC-1 cell extracts, using Rabbit (DA1E) mAb IgG XP® Isotype Control #3900 (lane 2) or SMARCC2/BAF170 (D8O9V) Rabbit mAb (lane 3). Lane 1 is 10% input. 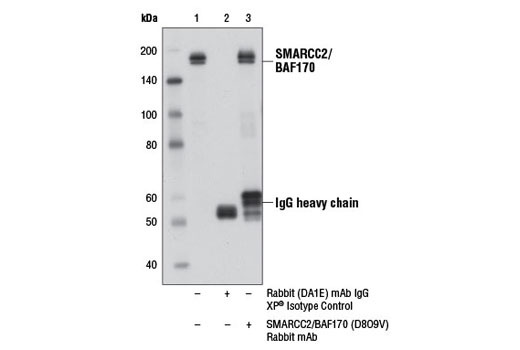 Western blot analysis was performed using SMARCC2/BAF170 (D8O9V) Rabbit mAb. Chromatin immunoprecipitations were performed with cross-linked chromatin from MCF7 cells, grown in phenol red-free medium and 5% charcoal-stripped FBS for 4 d followed by treatment with β-estradiol (10 nM, 45 min), and either SMARCC2/BAF170 (D8O9V) Rabbit mAb or Normal Rabbit IgG #2729 using SimpleChIP® Enzymatic Chromatin IP Kit (Magnetic Beads) #9003. The enriched DNA was quantified by real-time PCR using SimpleChIP® Human ESR1 Promoter Primers #9673, SimpleChIP® Human pS2 Promoter Primers #9702, and SimpleChIP® Human α Satellite Repeat Primers #4486. The amount of immunoprecipitated DNA in each sample is represented as signal relative to the total amount of input chromatin, which is equivalent to one. 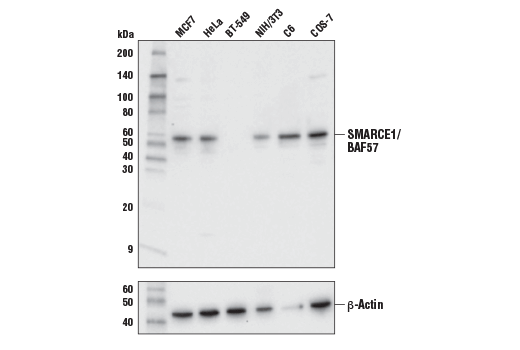 Immunoprecipiation of SMARCE1/BAF57 from MCF7 cell extracts. 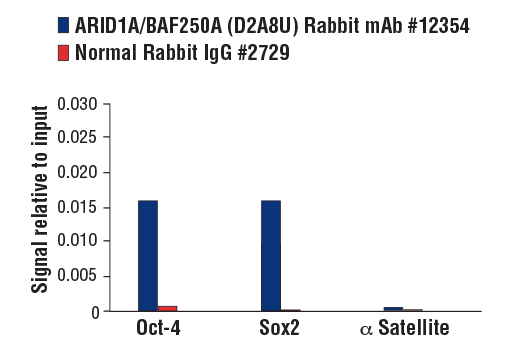 Lane 1 is 10% input, lane 2 is Rabbit (DA1E) mAb IgG XP® Isotype Control #3900, and lane 3 is SMARCE1/BAF57 (E6H5J) Rabbit mAb. 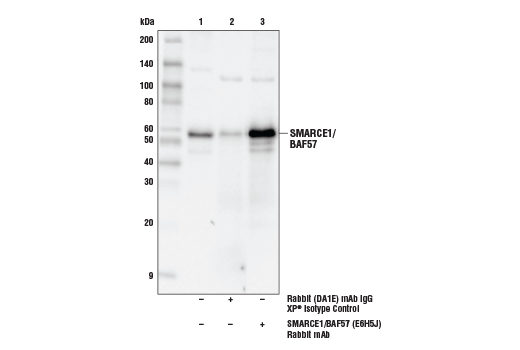 Western blot analysis was performed using SMARCE1/BAF57 (E6H5J) Rabbit mAb. 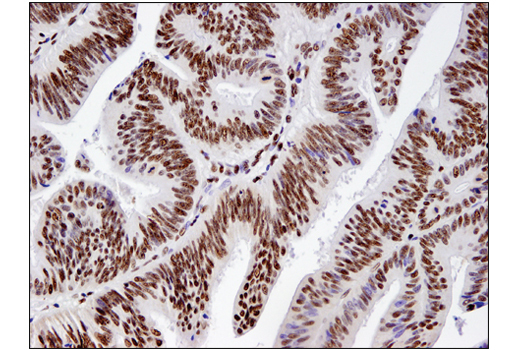 Immunohistochemical analysis of mouse colon using ARID1A/BAF250A (D2A8U) Rabbit mAb. 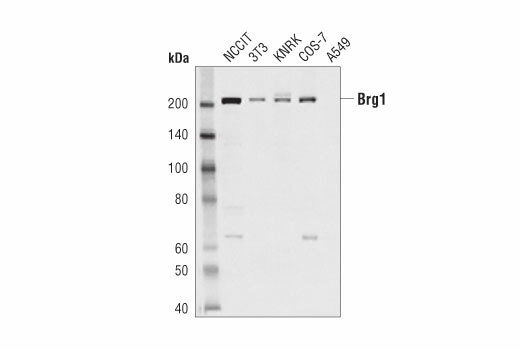 Immunoprecipitation of Brg1 from NCCIT cell extracts. 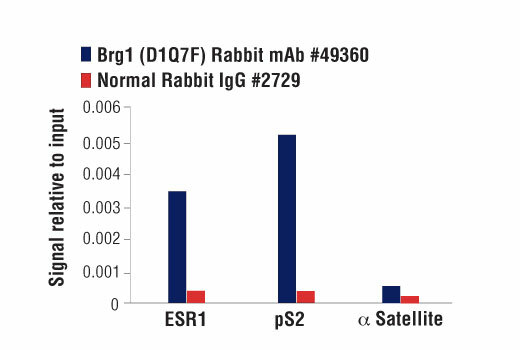 Lane 1 is 10% input, lane 2 is Rabbit (DA1E) mAb IgG XP® Isotype Control #3900, and lane 3 is Brg1 (D1Q7F) Rabbit mAb. 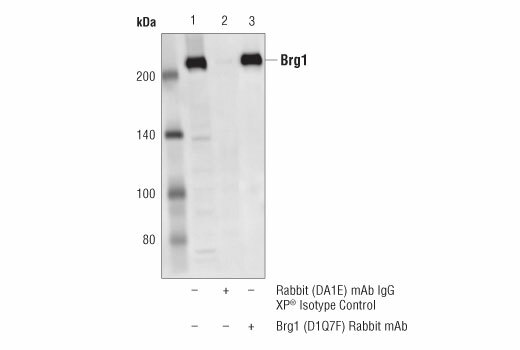 Western blot analysis was performed using Brg1 (D1Q7F) Rabbit mAb. 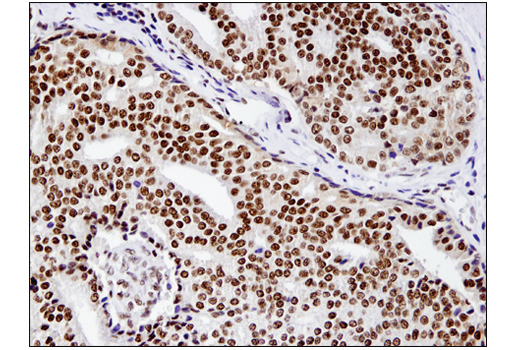 Immunohistochemical analysis of paraffin-embedded HeLa (left) and NCCIT (right) cell pellets using BRM (D9E8B) XP(R) Rabbit mAb. Chromatin immunoprecipitations were performed with cross-linked chromatin from MCF7 cells grown in phenol red-free medium and 5% charcoal-stripped FBS for 4 d followed by treatment with β-estradiol (10 nM, 45 min), and either SMARCE1/BAF57 (E6H5J) Rabbit mAb or Normal Rabbit IgG #2729 using SimpleChIP® Plus Enzymatic Chromatin IP Kit (Magnetic Beads) #9005. The enriched DNA was quantified by real-time PCR using SimpleChIP® Human pS2 Promoter Primers #9702, SimpleChIP® Human ESR1 Promoter Primers #9673, and SimpleChIP® Human α Satellite Repeat Primers #4486. The amount of immunoprecipitated DNA in each sample is represented as signal relative to the total amount of input chromatin, which is equivalent to one. 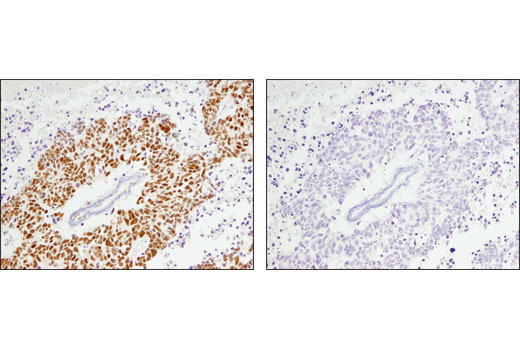 Immunohistochemical analysis of paraffin-embedded cell pellets, COS-7 (left) or T-47D (right), using ARID1A/BAF250A (D2A8U) Rabbit mAb. 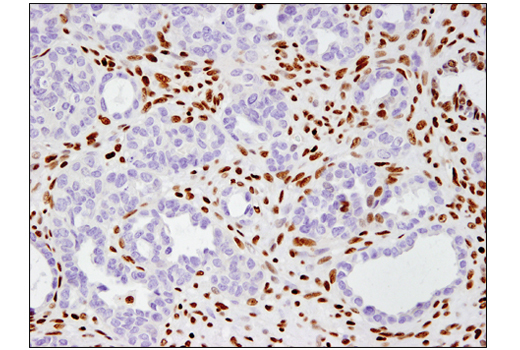 Immunohistochemical analysis of paraffin-embedded human clear cell adenocarcinoma of the ovary using BRM (D9E8B) XP(R) Rabbit mAb. 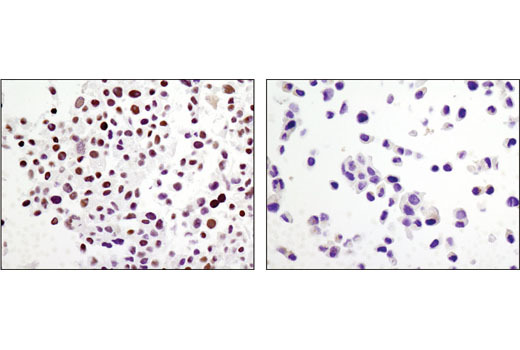 Immunohistochemical analysis of paraffin-embedded human lung adenosquamous carcinoma using ARID1A/BAF250A (D2A8U) Rabbit mAb in the presence of control peptide (left) or antigen-specific peptide (right). Confocal immunofluorescent analysis of HeLa (positive, left) and NCCIT (negative, right) cells using BRM (D9E8B) XP® Rabbit mAb (green) and β-Actin (8H10D10) Mouse mAb #3700 (red). Chromatin immunoprecipitations were performed with cross-linked chromatin from MCF7 cells grown in phenol red free medium and 5% charcoal stripped FBS for 4 d followed by treatment with β-estradiol (10 nM, 45 min) and either BRM (D9E8B) XP® Rabbit mAb or Normal Rabbit IgG #2729 using SimpleChIP® Enzymatic Chromatin IP Kit (Magnetic Beads) #9003. The enriched DNA was quantified by real-time PCR using SimpleChIP® Human ESR1 Promoter Primers #9673, SimpleChIP® Human pS2 Promoter Primers #9702, and SimpleChIP® Human α Satellite Repeat Primers #4486. The amount of immunoprecipitated DNA in each sample is represented as signal relative to the total amount of input chromatin, which is equivalent to one. The BAF Complex Antibody Sampler Kit II provides an economical means of detecting levels of various BAF complex components. 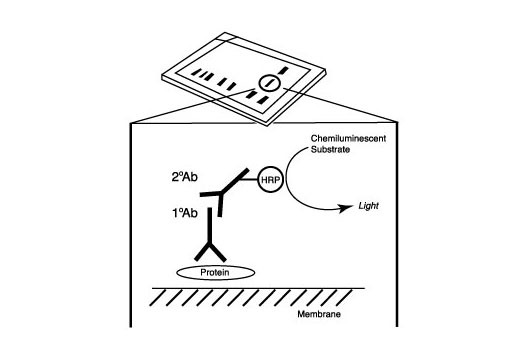 The kit contains enough primary antibodies to perform at least two western blot experiments. Each antibody in the BAF Complex Antibody Sampler Kit II recognizes endogenous levels of its specific target. Monoclonal antibody is produced by immunizing animals with a synthetic peptide corresponding to residues surrounding Gly1293 of human ARID1A/BAF250A protein, Ala1320 of human ARID1B/BAF250B protein, residues near the amino terminus of human Brg1 protein, resides surrounding Gly264 of human BRM protein, Gly975 of human SMARCC1/BAF155 protein, Ile818 of human SMARCC2/BAF170, and Leu34 of human SMARCE1/BAF57 protein. ATP-dependent chromatin remodeling complexes play an essential role in the regulation of various nuclear processes, such as gene expression, DNA replication, and repair (1,2). The SWI/SNF chromatin remodeling complex consists of more than 10 subunits with a single molecule of the ATPase catalytic subunit BRM or BRG1, but not both. The activities of these two subunits drive the disruption of histone-DNA contacts that lead to changes in accessibility of crucial regulatory elements within chromatin (2-5). The BRM/BRG1 containing SWI/SNF complexes are recruited to target promoters by transcription factors, such as nuclear receptors, p53, RB, and BRCA1 to regulate gene activation, cell growth, the cell cycle, and differentiation processes (1,6-9). 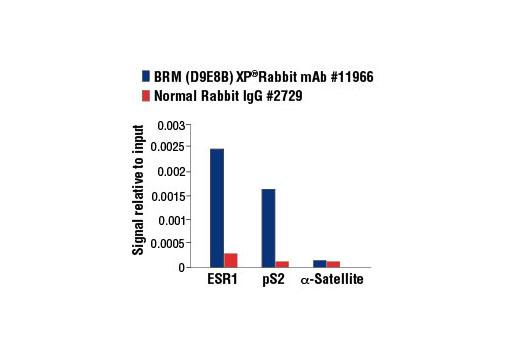 BRM and BRG1 are also considered to be tumor suppressors and their expression levels are severely reduced in several cancer cell lines (10-13). SMARCC1/BAF155, SMARCC2/BAF170, and SMARCB1/BAF47 are members of the core subunits of the SWI/SNF complex, which is necessary for efficient nucleosome remodeling by BRG1 in vitro (14). 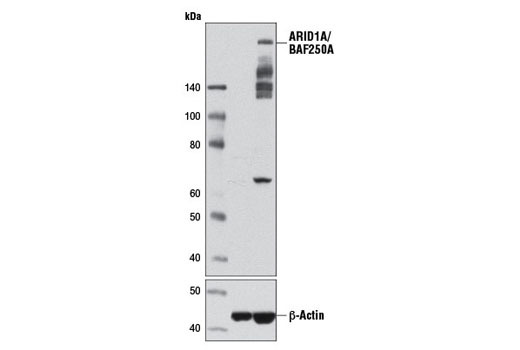 ARID1A/BAF250A and ARID1B/BAF250B are DNA-binding members of the complex. They are highly homologous and mutually exclusive, with ARID1B/BAF250B being a critical vulnerability in ARID1A/BAF250A mutant cancers (15-17). SMARCC1, SMARCB1, and ARID1A are an essential part of the mouse embryonic stem cell specific SWI/SNF complex (esBAF). SMARCC1 is necessary for early embryogenesis, especially proper brain and visceral endoderm development (18-20). SMARCB1 is necessary for early embryogenesis and hepatocyte differentiation (21,22). ARID1A is critical for embryonic stem (ES) cell pluripotency and differentiation into mesoderm-derived cardiomyocytes and adipocytes (15). 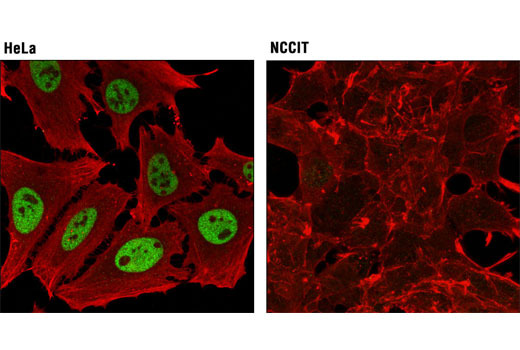 While SMARCC2 has been shown to be part of the SWI/SNF complex in non-pluripotent cells, it is absent in pluripotent ES cells. Expression of SMARCC2 has been shown to be up-regulated in neurons/neuronal progenitors upon differentiation of mouse ES cells with retinoic acid, and exogenous expression of SMARCC2 leads to loss of stem cell pluripotency and self renewal (23). Wang, X. et al. (2004) Biochem J 383, 319-25. Helming, K.C. et al. (2014) Nat Med 20, 251-4. Ho, L. and Crabtree, G.R. (2010) Nature 463, 474-84. Becker, P.B. and Hörz, W. (2002) Annu Rev Biochem 71, 247-73. Eberharter, A. and Becker, P.B. (2004) J Cell Sci 117, 3707-11. Bowman, G.D. (2010) Curr Opin Struct Biol 20, 73-81. Gangaraju, V.K. and Bartholomew, B. (2007) Mutat Res 618, 3-17. Lessard, J.A. and Crabtree, G.R. (2010) Annu Rev Cell Dev Biol 26, 503-32. Morettini, S. et al. (2008) Front Biosci 13, 5522-32. Wolf, I.M. et al. (2008) J Cell Biochem 104, 1580-6. Simone, C. (2006) J Cell Physiol 207, 309-14. Yamamichi, N. et al. (2005) Oncogene 24, 5471-81. Phelan, M.L. et al. (1999) Mol Cell 3, 247-53. Reisman, D.N. et al. (2002) Oncogene 21, 1196-207. Ho, L. et al. (2009) Proc Natl Acad Sci U S A 106, 5181-6. Shen, H. et al. (2008) Cancer Res 68, 10154-62. Weissman, B. and Knudsen, K.E. (2009) Cancer Res 69, 8223-30. Gao, X. et al. (2008) Proc Natl Acad Sci U S A 105, 6656-61. Han, D. et al. (2008) Dev Biol 315, 136-46. Kim, J.K. et al. (2001) Mol Cell Biol 21, 7787-95. Schaniel, C. et al. (2009) Stem Cells 27, 2979-91. Klochendler-Yeivin, A. et al. (2000) EMBO Rep 1, 500-6. Gresh, L. et al. (2005) EMBO J 24, 3313-24.